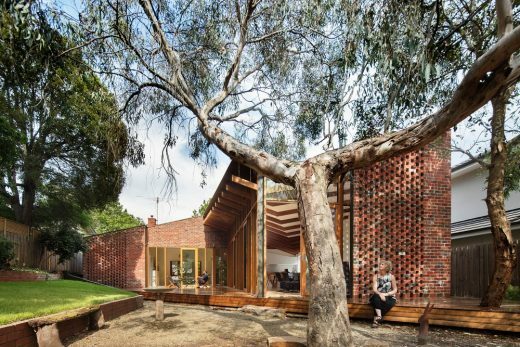 Underpinning our design notions and considerations for this home were two instinctual ideas: that of our client’s fondness for ‘Old Be-al’ and associated desire for an enhanced connection between the house and the old-growth eucalypt landscape; and our own determined appreciation for the house’s original brickwork, something we hoped to celebrate and re-cast within the existing dwelling. 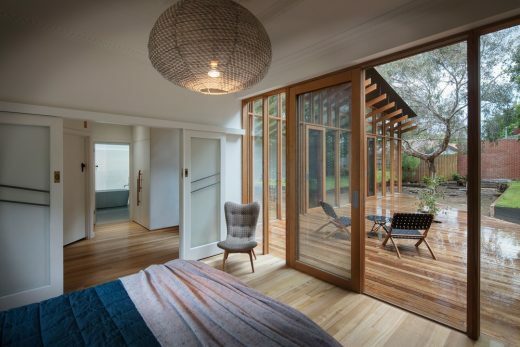 While considering the client’s brief of a two-bedroom, two-bathroom house, our design managed to reduce the overall footprint of the house and provide generous flowing living spaces with deep connection to the natural suburban landscape and the heritage of the existing house. 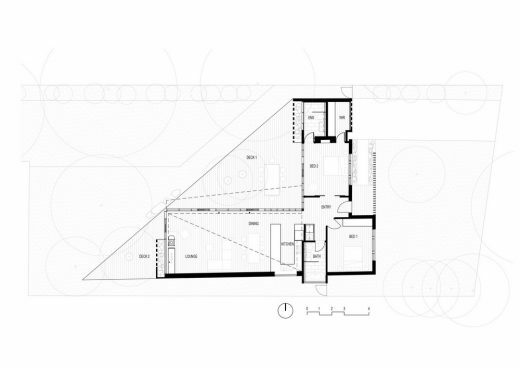 The reference to Old Be-al is constantly reinforced within the detailed design. 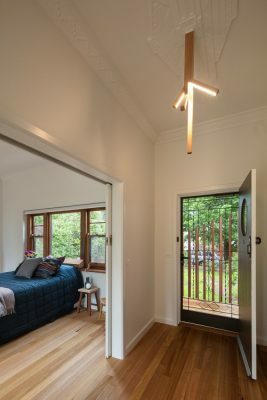 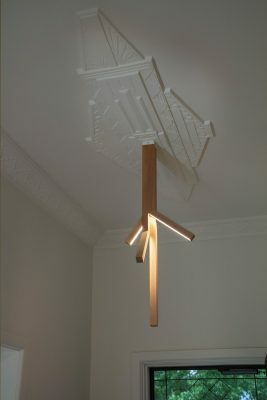 The custom-made entry light mimics its branches, as does the pulls on the joinery and even the custom towel rails in the bathroom. 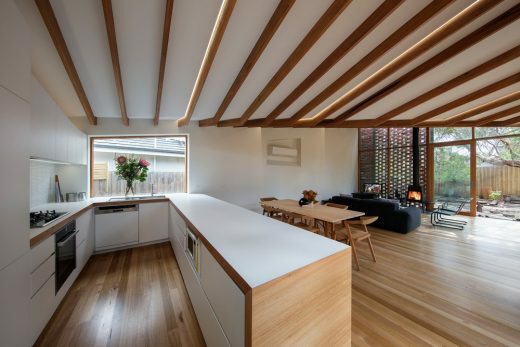 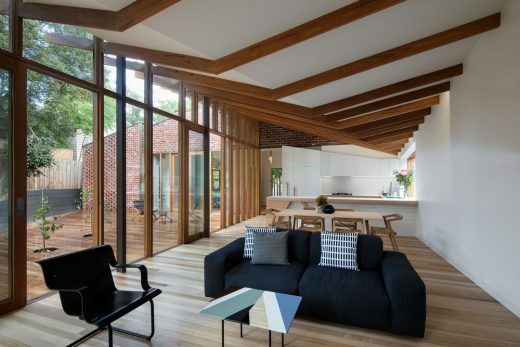 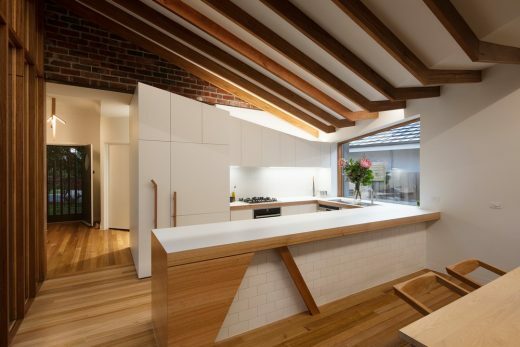 The dynamically angled ceiling of rhythmically spaced timber cross-beams that extend out to an expansive timber decking are in dialogue with the upper canopy of the surrounding trees. 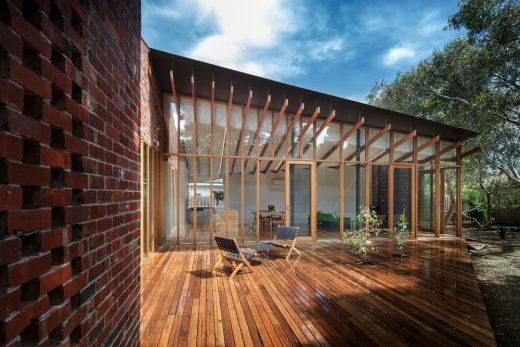 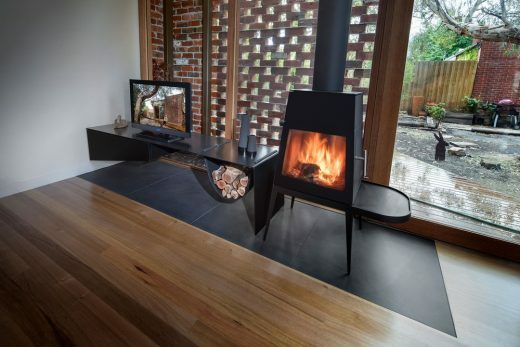 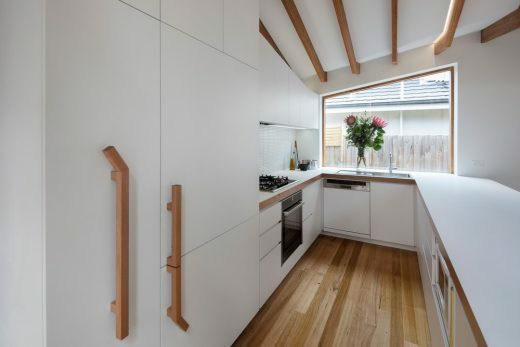 The rhythm of the bushland also finds expression in vertical mullions and horizontal bracing beams, reminiscent of both the trunks and the canopies of the adjacent trees. 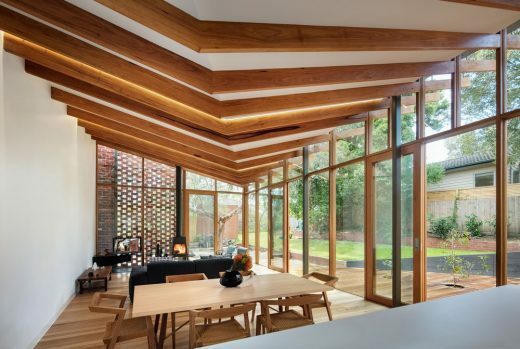 The form of the building also reflects the structure of Old Be-al, with the angles of the split trunk mirrored on the new roof forms and associated parapets and canopies. 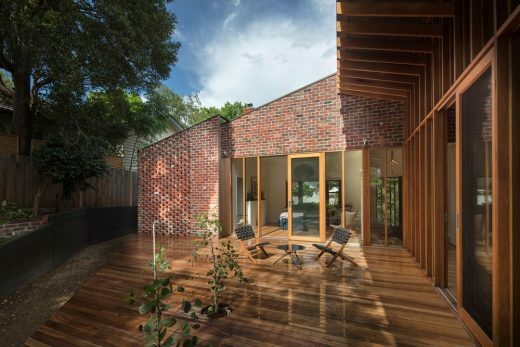 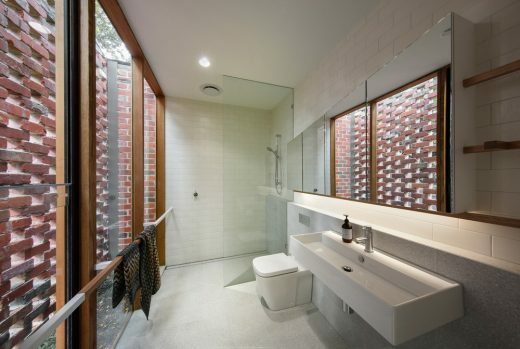 Two hit-and-miss brick walls at the perimeter of this open space have act as functional shading device for the western sun as well as privacy screens to the robe, bathroom and living spaces. 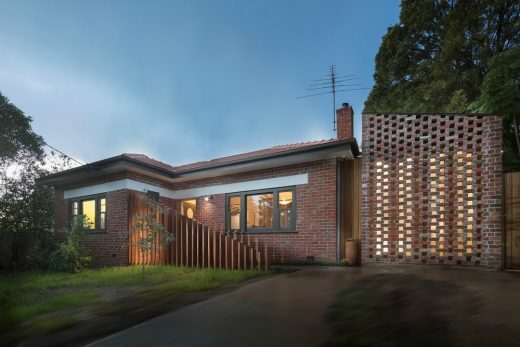 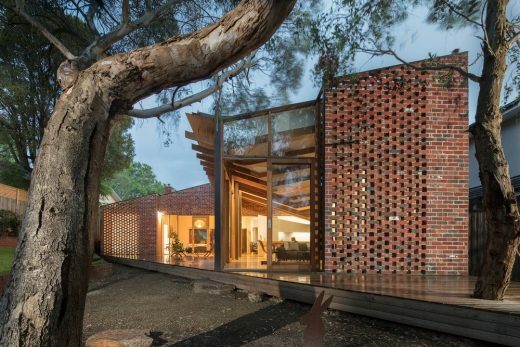 Through offering permeable elements they enhance appreciation for both the material itself and for the home’s unique personality and heritage. 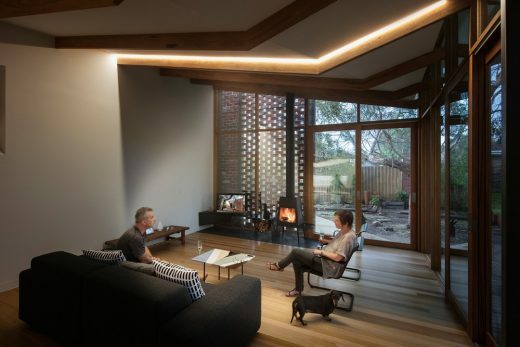 Through the partnership and appropriation of quintessential architectural materials in a new and dynamic way this project invigorates the life of the client through encouraging new connections between home, heritage and landscape.